Located off the coast of Costa Rica, the Jurassic World luxury resort provides a habitat for an array of genetically engineered dinosaurs, including the vicious and intelligent Indominus Rex. When the massive creature escapes, it sets off a chain reaction that causes the other dinos to run amok. 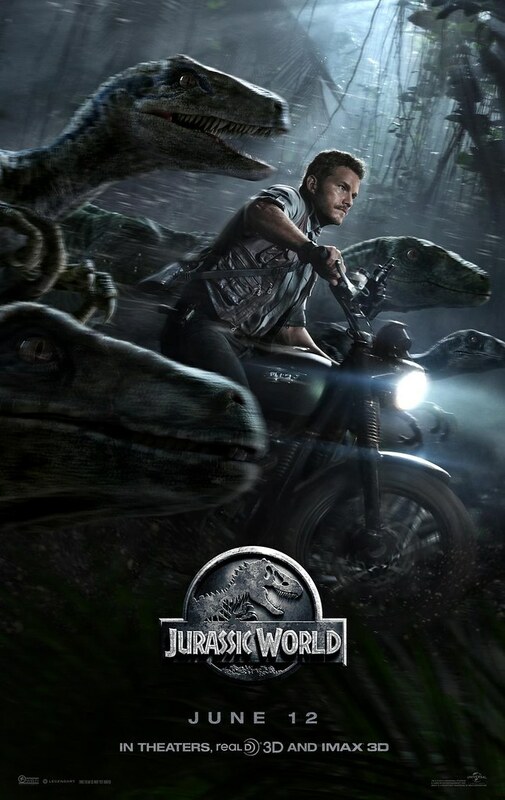 Now, it’s up to a former military man and animal expert (Chris Pratt) to use his special skills to save two young brothers and the rest of the tourists from an all-out, pre historic assault. Jurassic World is taking on 22 years after the failure of Jurassic Park (not the film but the park, because clearly, the film is a major success). The story itself is nearly the same as the previous film, Jurassic Park (1993). Some people even said that Jurassic Park is still better than Jurassic World. But in my opinion, Jurassic World is a great film. In fact, I think Jurassic World is one of the best films in 2015. I even get to watch the film twice. Once in IMAX, once in a regular cinema. Yes, it was that good to me. The number of the dinosaurs have increased. And now we have a new enemy in Jurassic World. The Indominus Rex is definitely bigger and scarier than the Tyrannosaurus rex. It is what made the film is more thrilling than before, I guess. Aside from Indominus Rex, we also have new big dinosaurs, which is the Mosasaurus, an aquatic dinosaur which to me look like the combination of shark, crocodile, and dinosaur. If the Velociraptors are the enemy before, now they’ve become some kind of an ally—in a way. And I really like that idea. Since Jurassic World is now a finished theme park, all the rides look so amazing too. I wish there’s a theme park like this one—minus the loose dinosaurs, of course. Anyway, Jurassic World is a fun adventure film, with some horror and thrill and a little bit of humour. Quite a few humour, in fact. There are many new scenes that are not in the previous films. Chris Pratt that usually does sitcom role but in Jurassic World, he showed us that he can act as a serious guy like Owen Grady—the character Pratt’s playing. He looks so cool when handling the Velociraptors, even though they are not real, but his acting is really really cool. The interaction between Owen Grady and the Velociraptors are interesting and thrilling to see. He can do some lines that can make us laugh. It’s funny in its own way, even though he’s not trying to be funny. It’s kind of refreshing, seeing that the entire film is thrilling. Not only Chris Pratt, Bryce Dallas Howard who acted as Claire has made quite an attention as well. I believe that everyone is talking about her after watching the film. At least to me, my sister, and also my friends. She succeedingly made us jaw-dropping. How can she not when all she did is running around with heels. Even though they are not platformed heels or stilettos, or even wedges. They are more like pumps but shorter, more like kitten heels but higher. She’s running with those heels while being chased by dinosaurs. How ridiculous is that? I mean, come on, even walking too long in those heels can hurt our feet, and now Howard is taking them to another level. It’s brill. It doesn’t make sense to think she could run around in the forest through the mud and stones and all, but it’s brilliant. Apparently, the question has been asked by many people. How is that possible to wear heels in that kind of situation? I think if the situation forced it, I guess it’s possible. And I think Howard really did a great job in Jurassic World. It’s not easy to wear heels and running around like that. Trust me, I know. The character of Gray Mitchell, played by Ty Simpkins, and Zach Mitchell, played by Nick Robinson, are also added some joy in the film. They both are funny and can make us laugh in the middle of those thrilling scenes. Both Ty Simpkins and Nick Robinson played their roles really well and their actions can really entertain us. Their expressions and acting skills are as good as the older actors such as Chris Pratt and Bryce Dallas Howard, or other actors and actresses as well. In the matter of the story, Jurassic World is, of course, thrilling. The running from those ancient creatures and all, it’s thrilling and exciting combined. It’s even better when I watched it in IMAX. The CGI effect in this film is amazing. The animation team made everything looks perfect. The new dinosaurs made the film is more thrilling too. Since it’s an opened theme park, the chaos is, of course, more chaotic and more disastrous. It makes everything more tensed. I’m amazed at how they managed to find so many cameos for the park’s visitors. They are so many and they really acted like they were seeing real dinosaurs. I can’t imagine how they shoot the scenes. It’s amazing. Really. However, the downside of this film is perhaps the ending. With all those runnings, killings, and escaping, I really wish I would be able to witness an epic ending. But I don’t really get that epic ending. It’s not a bad ending, it’s just too anti-climaxing, not as exciting as Jurassic Park. Masrani: You think the animal is contemplating its own existence? Owen Grady: She is learning where she fits on the food chain and I’m not sure you want her to figure that out. Jurassic World is indeed a great film. It is fun and exciting. I don’t know about the overall story compared to Jurassic Park, but I seriously think Jurassic World is the best action film in 2015. I can’t say Jurassic World is better than Jurassic Park because the original film is really epic. With the technology not as advanced as now, Jurassic Park is already very thrilling enough. However, with the help of the more advanced CGI effect now, Jurassic World managed to give us a more huge film and better animation. The setting is also perfectly set, better than before. Every aspect, every place and ride, every dinosaur are all being thought thoroughly. It’s beautiful and fantastic combined. Very well done for the design production and animation team. They have done a tremendous job. All in all, though Jurassic World is no better than the original film, it still worth to watch and definitely entertaining. I give Jurassic World 9 out of 10 stars.